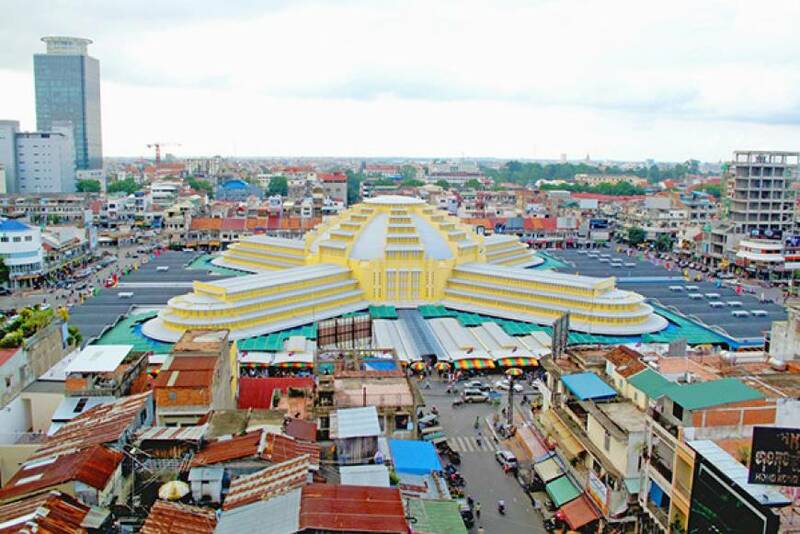 The Central Market "Psah Thom Thmey", is located in the center of the city and provides a hub for commercial activity in the capital. This impressively large building with its striking art-deco design was constructed in 1937, based on the drawings of French architect, Louis Chauchon. The building consists of a large central dome with four extended wings branching out to form long hallways. Today this is surrounded by further annexes that cover a myriad of stalls and shopping warrens. The market opens from 7:00 AM to 5:00 PM. There are literally hundreds of stalls, crammed with all manner of goods: gold and silver, antique coins, money exchange, men's and women's apparel, clocks, books, flowers, food, fabrics, shoes, souvenirs, fish, vegetables, fruits, t-shirts, scarves, kramas, kitchen wares, electronic gear, luggage and countless other products. It is the just the right place to strike up a bargain or find the perfect gift to take home.